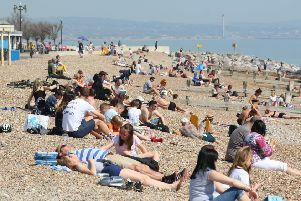 Sussex may have turned a bit greener thanks to more than a day of rain, but the forecast is for the hot weather to return to the county later this week. The temperature is due to climb from the current low 20s and be back around 30degC by Friday (August 3) and into the weekend. And August looks set to remain sunny for the most part across Sussex. For the first half of the month, the Met Office says: “Temperatures will be above the seasonal average for most, and it will be very warm, if not hot, in the south. “Plenty of sunshine will then continue for most regions. “Still, there will be a chance of isolated thunderstorms developing, but the wind will be generally light. “For many it will stay dry though, and by mid August, the very warm or hot conditions in the south may also move into central areas. Looking at the second half of August, the forecast is: “For the latter half of August, slowly changing weather patterns are likely to continue. “This means that drier and warmer than average conditions are the most probable overall. “Short unsettled interludes are also possible, however, and these are most likely in the south, with a risk of heavy showers or thunderstorms breaking out at times.